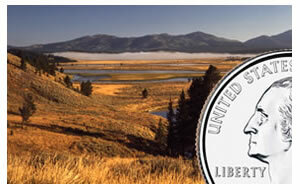 President Bush on Tuesday signed into law H.R.6184, America’s Beautiful National Parks Quarter Dollar Coin Act of 2008. The law mandates a new quarter series and, interestingly, 5-ounce silver coins. Beginning in 2010, five different quarter designs will be released each year that are "emblematic of a national park or other national site in each State, the District of Columbia, and each territory of the United States." To fulfill those requirements, it will take at least 11 years. But there is also a provision that gives the Treasury Secretary the authority to extend the quarter series for another round, and last some 20+ years. A three-inch, five-ounce coin is huge, to say the least. No U.S. bullion coin comes close to that size or weight. The popular American Eagle silver dollar is just 1.598 inches wide and contains a single ounce of silver. "Since the launch of the successful 50 State Quarters Program 10 years ago, I have been thinking about a follow up program. I am encouraged that this program has the potential to be every bit as successful as its predecessor-both as an educational tool and as a collector’s item," said Rep. Castle following today’s Presidential actions. The new law is sure to bring some interesting quarter designs. It will certainly change the bullion collector coin landscape. David L. Ganz for Numismatic News article: Park Themes Get Nod for New Coin Series. Susan Headley for About.com article: New State Quarters Program Awaits Signature.